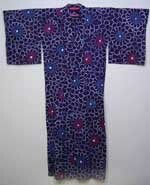 Kimono are organized from formal to least formal. Clicking on a photo will take you to a page with more detailed photos and descriptions. 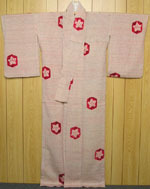 Hikifurisode is a type of furisode worn by brides after the wedding ceremony proper. 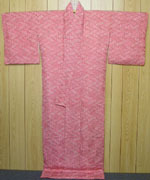 They’re longer than typical furisode, with a padded lower hem that can act as a train or be worn up like a typical furisode. This hikifurisode has quite a story behind it. 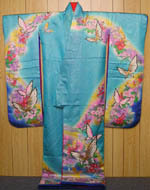 An eye-catching wedding furisode dyed in bright colors on silk with metallic threads woven in. 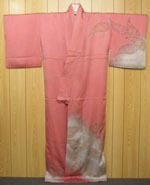 A furisode that was probably worn to coming-of-age celebrations, seijin shiki, in Japan. I plan to wear this to the reception following my (still unplanned) wedding. 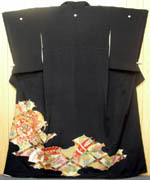 Formal black double-lined tomesode with yuzen dyed and gold-couched motifs of instruments used in Japanese royal court music (gagaku) and Heian ladies’ fans (akomeougi). 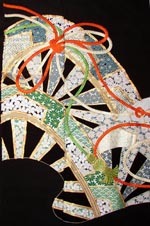 Kurotomesode with yuzen royal carriage wheels being washed in a stream (katawaguruma), embroidered braided cords and gold couching. 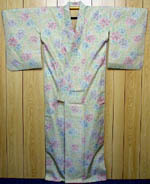 My first kimono, which I sewed together myself. 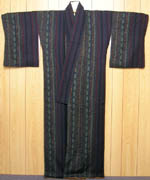 A tsukesage-houmongi is midway between a tsukesage and a houmongi in formality; characterized by designs that face upwards and flow over the seams uninterrupted (ebamoyou), but which don’t go over the shoulders or cover as much area as on true houmongi. 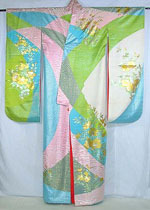 This kimono is dyed with kiku karakusa (chrysanthemum arabesque) motifs on ferns. 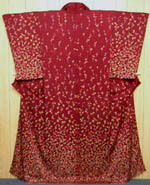 This tsukesage covered with autumn motifs is of a more modest design, using both yuzen dyeing techniques and embroidery. 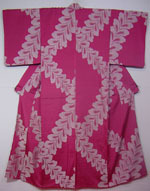 It was a delight to find this single-crested Edo komon, which is in my size, a favorite color, and has a lovely motif! Another beautiful Edo komon in a favorite color, with chrysanthemums sprinkled on poem rafts. As it doesn’t have a crest, it is less formal than the plum blossoms Edo komon. Although technically komon, Edo komon are more formal than their komon relatives with larger patterns (for instance, the komon listed below). 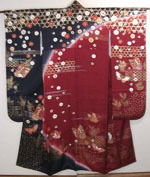 “Tsukesage komon” are kimono with small all-over designs (“komon”) that all face upward, and are slightly more formal than regular komon. 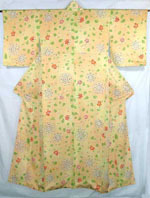 This kimono has small chrysanthemums standing on their stalks sprinkled throughout, with denser designs at the hem and sleeve edges. Karabana are imaginary flowers, here depicted with karakusa (scrolling vine, literally “Chinese grass”). 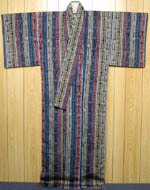 This is a yuzen-dyed komon with embroidery-type woven highlights. This amazing komon evidences considerable craftsmanship in its seemingly modest design. Edo komon meets delicate shibori. An understated komon in dark blues, reds, greens and rust. 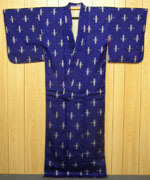 An everyday omeshi (heavy silk weave) kimono with tatewaku (rising steam) motif. 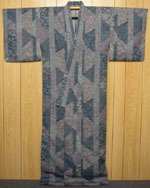 Unlined (hitoe) summer kimono with a kikyou – Chinese bellflower – motif done in kanoko shibori on a ground of very fine mokume (woodgrain) shibori. 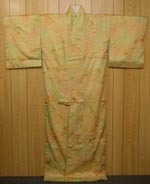 A summer kimono, unlined (hitoe), with large omeshi wisteria (fuji) motif. 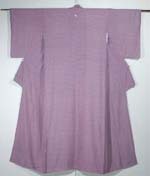 Tsumugi is made from hand-twisted filaments of hatched silkworm cocoons, and is stronger and thicker than “finer” silks. It’s characterized by nubs in the weave, which can be seen clearly herein. Pastel peonies done in a time-consuming weave. 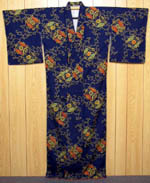 An indigo synthetic tsumugi with stencil-dyed fans and arabesques. 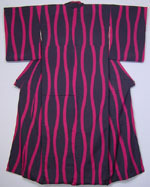 An every day kimono in rough silk crepe – most likely omeshi – with stripes containing unique motifs. 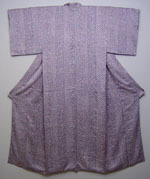 This kasuri-weave meisen kimono was well taken care of by its previous owner: patched in several spots and relined with soft, warm muslin. Be advised: this kimono packs quite the “colorful” surprise! Aizome is a traditional Japanese dyeing method which uses natural indigo dyes. Shibori is Japanese tie-dye, here done by tightly sewing each white, red, aqua and dark blue area in order to reserve, and later create, a pattern. Incredible hand work for another “simple” design.